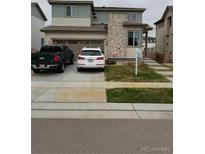 Below you can view all the homes for sale in the Reunion subdivision located in Commerce City Colorado. Listings in Reunion are updated daily from data we receive from the Denver multiple listing service. To learn more about any of these homes or to receive custom notifications when a new property is listed for sale in Reunion, give us a call at 720-729-2338. Don't miss out! Call today! MLS#6441659. Valor Real Estate, LLC. 2 car garage and relaxing back yard. Make this your home! MLS#3034092. Your Castle Real Estate Inc.
We invite you to tour this home today! MLS#2520278. Valor Real Estate, LLC. Being part of this community will allow you access to the recreation center which includes an outdoor pool, workout facility, and full-court gymnasium. MLS#7826846. Brokers Guild-Cherry Creek Ltd..
Garden fresh to table meals, you'll definitely be the neighborhood star with this home. Check out your future home! MLS#4869599. Keller Williams Preferred Realty. This home won't last long. Schedule your showing today! MLS#3476524. i Go Realty. It also allows for a rec room, or entertainment space. MLS#6589158. Kentwood Real Estate Cherry Creek. New high-efficiency water heater (2019), gas furnace (2017) & exterior paint (2018) Reunion Community pool, clubhouse & trails include in HOA. MLS#8270374. RE/MAX Professionals. Wired CAT-5 & CATV in every room & Whole House WIFI. Ask about the numerous upgrades! MLS#2313320. Colorado Home Realty. MLS#3879136. HomeSmart Realty Group of Colorado. Come take a peek at your new home! MLS#3487130. Keller Williams Preferred Realty. The basement is an open slate for your own design ideas. Set up a showing today! MLS#6608253. Resident Realty Colorado. Ask about your community pool, the NEW pool & rec. MLS#8478564. RE/MAX MOMENTUM. Don't miss your chance to make this beautiful and spacious house yours! MLS#1949814. Keller Williams Realty LLC. Comm Pool; 1 block from park/playgrd; You'll love it all! MLS#7530343. MB BELLISSIMO HOMES. Covered Front Porch / 8' Front Door / Engineered Laminate Floor / Oiled Bronze Hardware / Wrought Iron Railings / Pedestal Sink / Loft /Recessed Lights / Upper Level Laundry / Dual Sinks / Walk-In Closet / Gas Fireplace / Corian Counter Tops / Kitchen Island / 9' Ceilings / Stainless Steel Appliances / 42" Cabinets / Walk-In Pantry / 8' Garage Door / Sprinkler System / Water Softener / Radon Mitigation / Central Air Conditioning / Fenced Yard / Drywalled & insulated Garage / Stop & Drop Mud Room / Location!! Location!! Location! ! MLS#2896308. RE/MAX PROFESSIONALS. Enjoy all that Reunion has to offer with parks, trails, shopping and restaurants nearby. Welcome home! MLS#9801354. West and Main Homes Inc.
5 blocks from new rec ctr! Free summer concerts and movies! MLS#3290634. HIGHGARDEN REAL ESTATE INC. The basement is ready for your finishing touches (full egress window wells, tall ceilings & rough-in for a 4th bathroom). MLS#8888723. LIV Sotheby's International Realty. All furnishings are for sale, if interested. MLS#1744820. Freedle and Associates LLC. Located in the Reunion community with access to rec center, Reunion pool and the soon to be built NEW Southlawn pool will be a short walk away. See this home today! MLS#7751328. Amy Ryan Group.